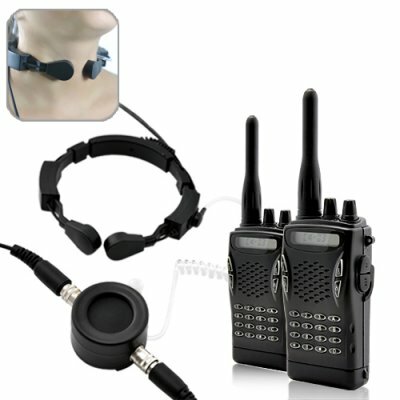 Successfully Added Professional Walkie Talkie Set (UHF, 220v) + Throat Microphone to your Shopping Cart. Crystal clear radio communication in the noisiest environments with this professional grade walkie talkie set with throat mic. This premium two-way communication set consists of a throat microphone and pair of powerful walkie talkies, also known as HT's (handheld transceivers). They allow for instant communication without the need of cellphone coverage or monthly service fee and are ideal for: security, maintenance crews, fire departments, trade shows and exhibit events, wilderness areas where phones do not work or overseas holiday travel where using a phone may be expensive or troublesome. This military spec throat microphone (AKA laryngophone) picks up sound directly from your vocal chord vibrations and cancels out 90% of all background noise. This allows for crystal clear communication in loud environments such as construction sites, night clubs, while riding a motorcycle, driving a convertible car or while attending your favorite sporting event. Traditional microphones simply cannot compete. The two ultra sensitive throat sensors are also able to pick up your slightest whispers as well. Making this throat mic perfect for use in covert applications such as paintballing, detective work or military operations. And the transparent coiled acoustic tubing with earbud provides you with a low profile look while at the same time delivering high quality audio that only you can hear. This is the same exact technology the German and U.S. military use. These walkie talkies are the most reliable, convenient, and at the same time the most economical way to keep in touch with other members of your team. They come complete with rechargeable batteries + charging stations and easy to follow instructions so you can start using them within minutes of receiving your package. If you need always available two-way communication, don't wait any longer, click "add to cart" to get your two-way radios + throat mic today. These professional grade walkie talkies with throat mic come with our full 12 month guarantee and are in stock now. Compatible With: Motorola, Kenwood, Icom, Maxon, Vertex, Chinavasion’s CVESQ-PG5118 and CVSB-J48, and more. This product is water resistant and weather resistant and can withstand harsh environments. However, do not submerge this product under water for any period of time since it is not waterproof. This throat mic set offers premium thick gauge polyurethane wiring, heavy duty spring loaded 4 pin mini din connection points, high impact polycarbonate construction, and modular microphone cables- making field repairs quick and easy. This device also comes with a clip-on PTT button (push to talk) as well as a mini Velcro PTT button for quickly contacting other members of your party without having to touch your walkie talkie. The neck piece of this throat mic set is fully adjustable so this one set can be used on people with thick or thin necks. This set also comes with all coiled cables to ensure no messy wires will be left hanging around. Can I use different microphone/earpiece adapters with the throat mic? Yes, as long as they use the same circular 5 pin connector.